If you are looking at getting married in Spain and like the idea of your wedding location set in a quaint town which has both beach and also an authentic Spanish feel then you might like to look at having your wedding in Spain in Nerja. Nerja is only 40 minutes East of Malaga, and as a holiday resort has held on to its typical Spanish routes, whilst you can enjoy the golden sandy beaches they have a some great traditional tapas bars and places to eat to enjoy the delights of the Mediterranean cuisine. There is a lively town center, which buzzes with locals and tourists drinking and partying the night away so you really get to feel the Spanish and their way of life. That is exactly why Steve and Jene chose to have their wedding in Nerja Spain. They knew the location ticked all their boxes where all their family and friends flying out to their wedding in Spain would not be disappointed, and would get to enjoy not only the wedding day itself but spending time on a break away in the Spanish sun. Steve and Jene decided on a traditional Catholic ceremony for their wedding in Spain and chose Figilana church found in the most quaint and gorgeous square setting the scene for their traditional wedding in Spain. Like many other couples they asked us, as their wedding planners in Spain, to help them through the process of organising their legal paperwork, which we took care of once the church date had been booked. Steve and Jene’s wedding in Spain arrived and everyone was so excited. To start the celebrations and to offer their guests, who had flown over from Ireland, the opportunity to experience as much of the location and surrounds as possible a refreshing drink was served in the Pueblo in Figilana . Just before the bride and her 4 bridesmaids arrived guests were ushered into the church to the sounds of beautiful singing along side a guitar playing. The ceremony was traditional and even though the priest was marrying Jene and Steve, at their wedding in Spain, the service was all in English so all their guests could understand and could enjoy each moment. Finally the bridal couple were married and so the celebrations could begin again, starting at a tapas bar just opposite the church everyone enjoyed some light refreshments and looked on whilst the wedding party had a photo opportunity outside the church. Shortly after they were lead down the cobbled streets just a few minutes to reach their transport which would take them to their next wedding venue in Spain where the rest of the celebrations would take place and where most guest were staying the night. The drive to the venue, which was just up in the hills in Nerja, with views of the Spanish countryside the journey seemed even more interesting and exciting. The trip was coordinated and timed to perfection so when their guests arrived their wedding planner in Spain and the hotel staff were all ready and waiting to greet them, and the newly married couple, with a glass of cava and some light canapés which were served for an hour. Dinner was held in a stunning room with glass walls providing that feeling of being inside yet outside with views of the grounds of the hotel, rural countryside and Mediterranean Sea in the distance. Once everyone were satisfied from all the gorgeous food and drink that had been served, and the cake had been cut, the party then moved to the other end of the room where a live band geared up the the party for a long night of drinking and dancing, followed by a DJ for the remainder of the night. The next day Steve and Jene invited all their guests to a lovely tapas bar in the center of Nerja where more food and drink was consumed whilst stories flew around the tables of the previous days celebrations. 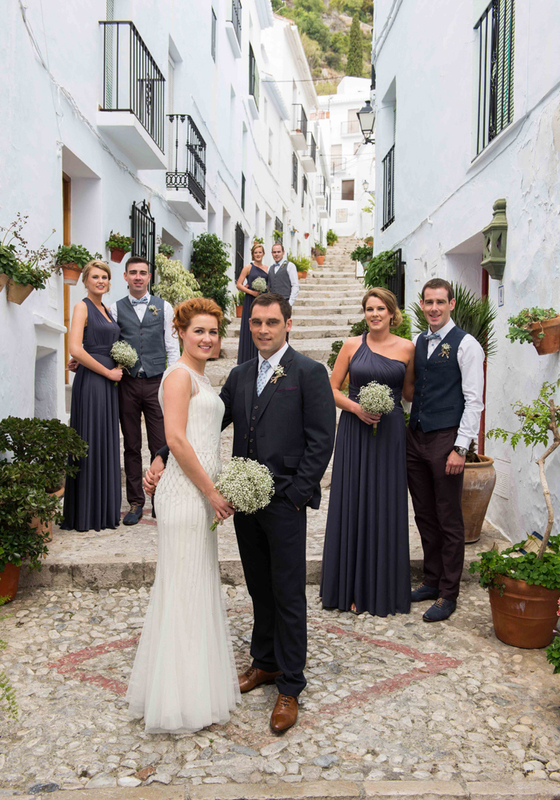 Steve and Jene really knew how to provide their guests with a party and with the help of their wedding planners in Spain; Sunshine Weddings Spain, they were able to offer a real authentic Spanish wedding for their Irish family and friends.